2 metal drums covered with Letraset lines. Mounted in a black box, motor. Drums rotated in opposite directions. Lijn made this piece inspired by a machine she saw on a visit to the Musee de la Decouverte in Paris. It had a curious effect when it spun (approx 45 rpm). The black lines interfered with one another creating coloured moiré patterns. Two friends of hers, the photographer Jean-Loup Charmet and a friend of his, made a book for Lijn based on this work in which she goes on to open an enormous Vibrographe factory. 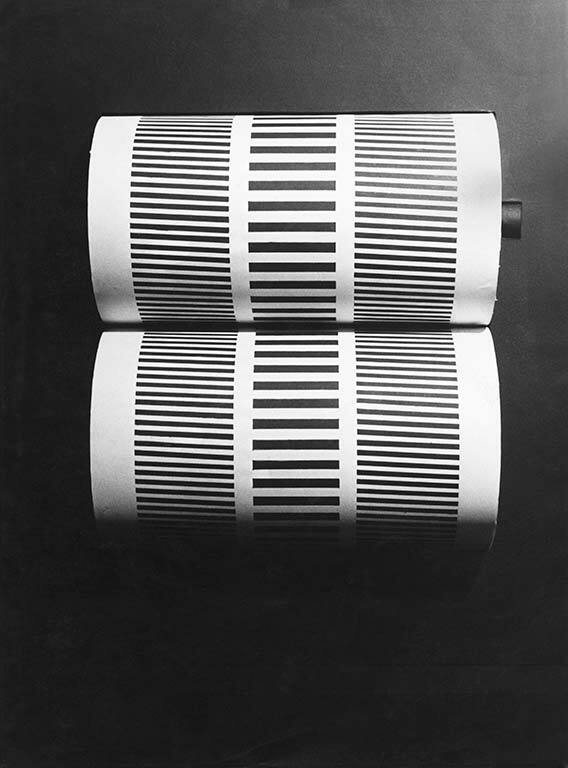 Although Lijn exhibited it in her first solo show at the Libraire Anglaise, Rue de Seine in 1963, she had by then decided to use words on the cylinders. Lijn felt that words, made from separate letters, were essentially structures made from lines, and therefore could be deconstructed into energetic vibrations in the same way as the Vibrographe. On the plus side, words even when dissolved by motion still contained meaning.